Welcome to Step Away From The Carbs! 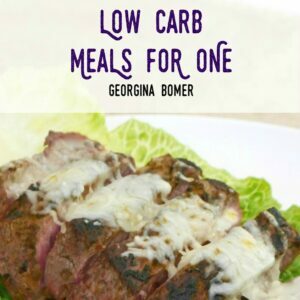 I’m Georgina, and I’m a long term low-carber! I’m not a doctor, nutritionist or dietician. Just a regular mom who has found that the low carb life the *only* sustainable way to keep my weight down. I started the low carb way of life back in 2008, (are you starting too? Read my guide for beginners! ), and have continued to manage my weight since then by controlling my carbohydrate intake. Although some days it’s hard to keep motivated – and like any regular person I have had some slip-ups along the way – low carbing is very much my way of eating now. From the day I started this blog I have been committed to providing readers with easy and delicious recipes with a short list of ingredients. I also feel strongly that portions sizes should be generous: yes, these were diet recipes, but I still didn’t want anyone to go hungry – including me! Although most of my recipes are prepared from scratch, I am certainly happy to embrace some short-cuts. I particularly like using low carb tortillas, for example, and have used them to make tacos, nachos, chips, lasagna, and more! I’m sure you’re as busy as I am, and these convenient low carb products can really make a big difference. Did you know that I have published five books?!? The first was The Dieter’s Chocolate Cookbook published before I started writing this blog. It not only included low carb chocolate recipes but also sugar free, low fat, and low calorie ideas. I learned so much working on those recipes and I loved sharing them with fellow low-carbers who needed some inspiration and help! In 2016 I completely revised the book and added some color photos! Low Carb Chocolate Recipes includes over 60 low carbohydrate and sugar free dishes and is perfect for anyone with a sweet tooth! Encouraged by the response to this book, I wrote Low Carb Family Favorites which is perfect for holidays and family gatherings, and Low Carb Snacks and Low Carb Meals For One, which are both invaluable resources for helping to stick with a low carb diet. I love working with brands and companies – so if you’re interested in working together, let me know! If you have a question about one of my recipes, please email me at info @stepawayfromthecarbs.com (remove the space). If you are interested a promotional partnership for your low carb product or service, please see my Advertising & Sponsorship information.